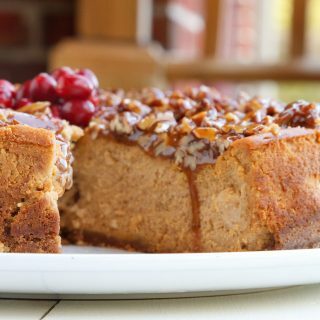 Enjoy this classic dessert with a little twist. 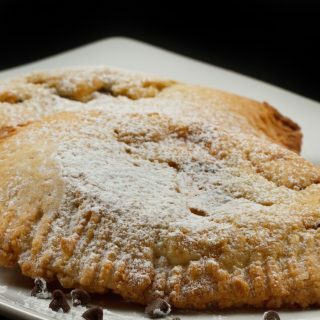 The light taste of bourbon in the pecan pie filling with a chocolate ganache is simpy amazing! When it comes to Pecan Pie you’ll find recipes all over the internet. 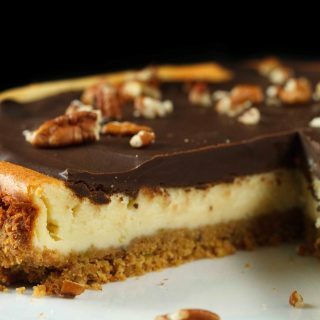 My variation with a little bourbon in the filling and rich chocolate ganache will make this pie perfect for every occasion. I used a 9-inch deep dish ceramic pie plate for this pie, but I think it would make a great pecan tart, just with a lighter chocolate topping. But whichever way you make it, I know you’re going to love this old time favorite, I can tell you it’s going to make another appearance on my table in the very near future. Most people think of pecan pie at Thanksgiving but it’s a delicious dessert that can be served any time of the year. This rich dessert is a southern classic and was made when pecans were plentiful usually around October -November. And that my friends is why you usually see pecan pie at Thanksgiving. If you like pies you might want to check out my recipe my recipes for more Thanksgiving favorites including a more traditional pecan pie. combine the flour, sugar, baking powder and salt in the bowl of a food processor and pulse 3 times to mix. add the eggs and pulse until the dough forms a ball on the blade of the processor. Turn the dough out of the food processor onto a floured surface, and carefully remove the blade. Divide the dough in half and flatten into discs. on a floured surface roll out pastry dough with rolling pin, roll out dough about 1 1/2 inches bigger all the way around than a 9-inch pie plate inverted. Place dough in the pan, and decorate the edges as you like. refrigerate finished pie dough until needed. In the bowl of your mixer beat eggs slightly, and add in corn syrup, sugars, salt, butter, bourbon, and vanilla, mix well. In a bowl over a pot of simmering water melt the chocolate with the heavy cream. 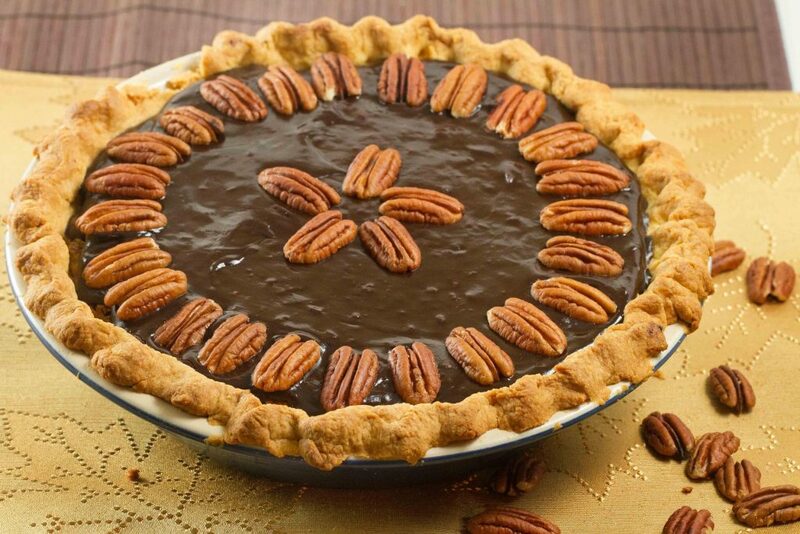 When the pie is done baking, allow to cool for about twenty minutes then top with chocolate ganache and pecan halves. Refrigerate for about an hour to allow to fully set up for about an hour. *I always make two doughs, even if I freeze one for later, it's just as easy to make a full batch and then I have a dough for later. **Crust may get too dark, cover edges of pie dough with foil to prevent it from burning. I hope you have a very Happy Birthday Rene! It’s the same with me, if I want a cake I have to make it. I’ve cooked rack of lamb many time but don’t have it on my blog. My wife doesn’t eat lamb (which is why it rarely makes it onto the pages) but its a great suggestion. I’ll add it into the mix. Pecan pie is one of my favorites! The addition of the chocolate looks outrageously delicious!!! mmmmm bourbon…..definitely takes the pie from awesome to epic! I really didn’t think pecan pie could be improved upon. You’ve done so!!! I’m drooling….looks extremely good and the ganche topping is to die for… hard to resist. Beautiful photos. Have a nice day. Be still my drooling tastebuds…ganache really does it for me. I have never in my life made a pecan pie. I love the stuff, just never attempted. I don’t have my meal plan complete for the big eating day…EEK! 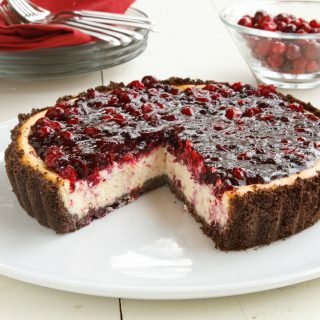 That’s one of the best looking pie I’ve seen online ! Wow. I am sitting at work and all I want to do is run home and make this! Great recipe, chocolate ganache makes everything better. That is one GORGEOUS pecan pie, with a “die for” ganache topping. Stealing the recipe from you and putting it on my list to make for the holidays…especially for Christmas. Lora already has her own pies picked out to make! Linking back to you for the Gala Dinner photos, that I finally posted! No kidding, this makes my mouth water! Congratulations on your Foodbuzz award, I was actually told a few months ago that you are the go-to person when it comes to blogging! I’ve only ever tried pecan pie in cheap restaurants in the UK and needless to say, it was always dry and stodgy. Your photos have shown me why people go so crazy for a pecan pie though. It looks lovely! This looks stunning! 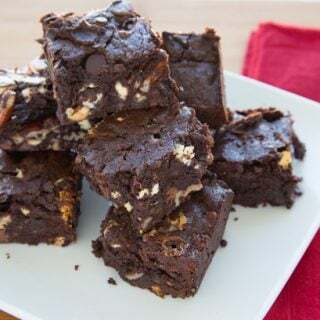 The perfect slice 🙂 The chocolate on top and then the nuttiness on the bottom-stellar recipe! Chef Dennis, you’re a genius! 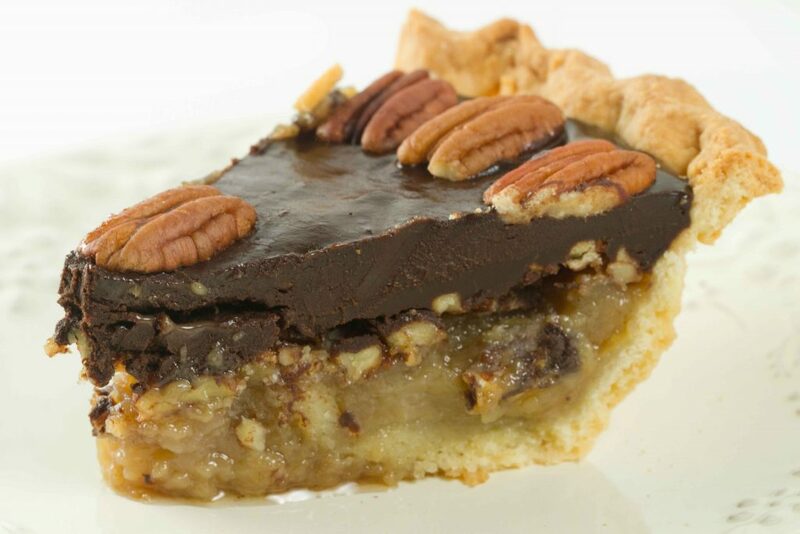 Pecan pie is so delicious on it’s own, but with a layer of rich chocolate ganache too? YUM! Plus, it’s such a beautiful presentation. I’d do anything for a slice of this stuff right now. I love that pie. May I have a slice? Chef, that is one delicious looking pecan pie! I hope you have a fantastic Thanksgiving. This makes me so nostalgic for holidays in the south! that is MY idea of a great pecan pie! Mind you, I love the old standby but to top it with chocolate (I’ve never cared for the ones that mix the chocolate into the filling) is pure Heaven! This may very well take the place of our normal pie this year, Chef. YUM! OH WOW! What a dessert that is for Thanksgiving! Bourbon Pecan Pie…whooo! Now that is a real winner in my book. Anything with Bourbon is A-OK in my book! I know what you mean about time changes. One hour can affect me hugely! Glad you’re back in the swing of things.. This looks absolutely incredible. My husband makes a killer chocolate pecan pie that I dream about. This looks like something he HAS to make for us this holiday season. Printing this just for him! The pie is gorgeous. I have always loved pecan pie (it was something that my Nana was always make). Your version looks so decadent with the chocolate ganache and the pictures just relay a mouth watering dessert. Thanksgiving wouldn’t be Thanksgiving without a pecan pie. Perfect twist on an old favorite. Chef Denis, I bake a pecan pie every Christmas but never with chocolate ganache. This Christmas I will use your recipe and I am sure I will WOW my family! Thanks. I think it’s safe to say that I swooned when I saw the title of this post. 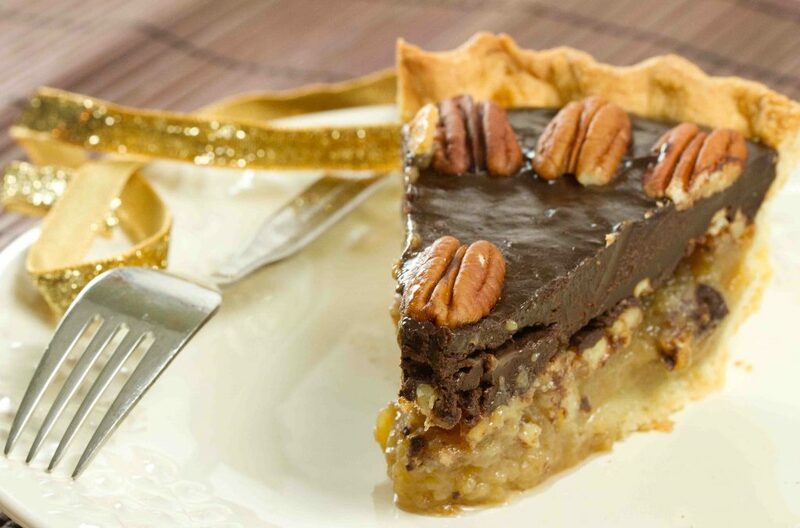 Pecan pie is one of my favourites ever, and dressing it up with bourbon and chocolate? Can I come over? Please??????? I, like you don’t stray too far from our traditional holiday meals. I think there’d be a mutiny in the house if I did. However, the fam doesn’t mind me adding new desserts as long as I include the standards. The ganache on this pie is on point Chef, love it and saving it. This is a wonderful pie. I love the design you put on the top. So cute. I am starting to feel like I should celebrate the American Thanksgiving. I know I already had my Canuck version but you are making me want it all over again. Hope you have a lovely week. Beautiful! What a gorgeous kickstart to the thanksgiving countdown! The ganache is to die for! I will be making this!! I will make the crust gluten-free, but I can keep the filling exactly the same. This looks amazing. Thanks for sharing. This looks amazing! I absolutely love the sound of a bourbon pecan pie- I am going to make this as a treat for my dad- he loves pecan pie and loves a good bourbon! Well I made this pie and it was awesome! The measurements are all right on as were the directions so I will definitely keep the recipe. I was leary about making pastry in a food processor but it turned out and I was happy with the results. The pastry suited the filling well and I will continue to use it when I make the pie in the future. Great job chef Dennis. You have a new fan. happy to hear it worked well for you Elesa! Perfect kick off to the Thankgiving countdown! The pie looks serious. I love the tell tale pecan texture underneath the ganache. I can imagine the flavors to be rich and lush. The perfect thing to knock one out at the end of the big meal. Beautiful! It was nice to meet you, out on the deck, at the Taste Pavilion at Foodbuzz. Pecan Pie is good, but not my favorite…that’s only because sometimes it’s just too sweet for me. That said, you kicked it up several more notches with the ganache. I’d happy eat a slice of that pie! A beautiful beautiful pie! Such awesome photos too! That thick ganache just makes me swoon! That is one good looking pie! I always liked pecan pie, but the addition of ganache and bourbon makes it completely irresistible. Adding this to my pie list for Thanksgiving. Thank you, Chef! Loved the your twist on Pecan Pie Chef. That chocolate ganache just took it up to a whole new level for me, well done! Wow, now that’s a pie. I would be giving the ganache layer to a family member, but I’d dig in with gusto on the rest of it. It’s looking like we’re going to have a quiet Thanksgiving dinner so I’ll be able to mix things up a bit, especially since I can’t make my mother-in-law’s stuffing properly. Why even try? I’ll just make something totally different. I think this would make Hubby happy to have for dessert though. The bourbon alone would bring about an ear-to-ear smile. Thanks for sharing!